Apartment ideally placed in pedestrian street that communicates the Park of Retiro, Major Plaza and the Royal Palace. Located close to the most famous Museums (The Prado, Thyssen, Reina Sofía, Foundation Caixa Forum), the Park of Retiro and Botanical Garden, the Sources of Neptune and Cibeles, the Puerta del Sol and Puerta de Alcala, Major Plaza and Royal Palace. Zone of Theatres, Cinemas, Shops, Restaurants and Coffees. Without need to use transport, everything walking. Apartment in historical building rehabilitated with great lounge with chimney. Great location and very friendly and helpful owners. The apt is perfectly located for seeing the sites in Madrid. Its big and well appointed. The hosts could not have been nicer or more accommodating. I will definitely stay here again. 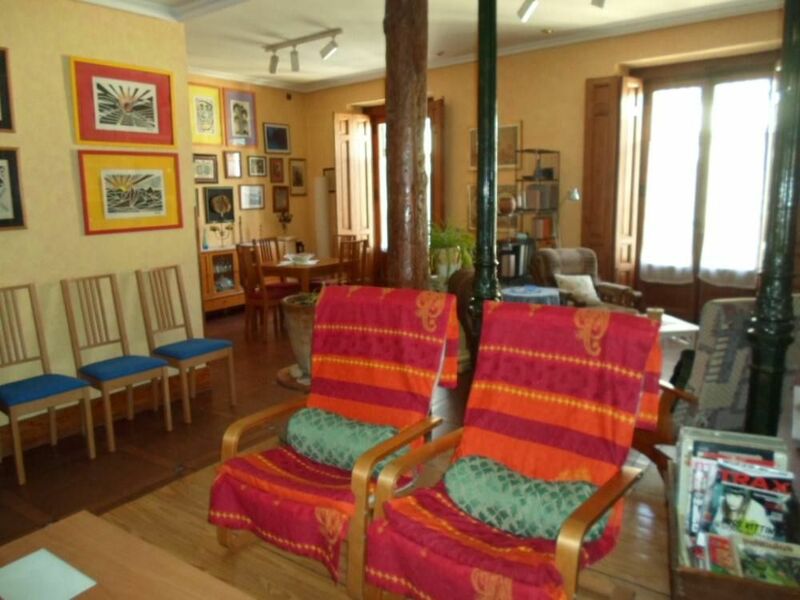 "A very sympathetic apartment in the very heart of Madrid. We enjoyed it as an ideal departure point for getting to know this beautifull and lively city. Everything just around the corner or on walking distance: Prado, Reina Sofia, Thyssen Museum, Plaza Major and not to forget the Mercado San Miguel. The apartment is silent, spacious and very confortable. The Barrio de las Lettras is very nice. Domingo and his wife were very kind and helpfull. A big ''Gracias'' for them and their city!" "This was a great place to stay. Three couples had plenty of really comfortable living space, 3 bedrooms and 2 bathrooms. A great kitchen with a washing machine, even had washing powder. Was in a fantastic location close to everything and within walking distance. Never used public transport. The owner, Domingo, met us at the flat and was very helpful. Would recommend to all. So glad we chose this apartment. " "This apartment is wonderful in every way! Location is superb, 5 minute walk to Metro and to Prado, unbelievable number of restaurants and cafe/bars nearby. Even though a lot of activity in area, cars are restricted, so apartment very quiet most of the time. Apartment very clean & beautifully furnished and decorated. Plenty of linen, very nice towels, kitchen has everything needed. We were 6 adults, and it was very roomy for us. Dishwasher & washing machine worked great. Heat set by thermostat was generously warm for Christmas time. Domingo & Carmen very nice and supplied good map with tips on markets,etc". - Principal buses of the Center and Tourist Bus. - Undergrond: Line 1 (Antón Martin) and 2 (Banco España). - Taxis to 100 meters (Hotel Palace and Paseo del Prado). - Near Atocha's Train station (AVE and Surroundings) and Bus Express 24 H. Airport. - Public parkings to 200 meters. Zone Center to enjoy Theatres, Cinemas, Shopping, Restaurants and Coffees. Walks walking to enjoy the captivation of the Center of Madrid. Routes in Tourist Autobus and excursions in Bicycle with guide. Tarifas decrecientes en función de la duración. Precio para hasta 6 Personas. Incremento de 25 € más por persona/noche a partir de la 7ª persona. Todos los trámites a la llegada (Recepción. Firma del Contrato. Entrega de llaves. etc.) las realiza personalmente el Propietario. Propietario ausente durante la estancia.